The plans featured on this page are all drafted using AutoDesk AutoSketch, and saved as Adobe Acrobat PDF files so you can print them out in fine detail ready to build. You can get the free Acrobat Reader from Adobe. I sometimes hear from folks who have built and flown models from these plans. Click here to see some examples of their efforts. The Falcon is a single-place aerobatic ultralight biplane. It was designed by Eric Whitney (with the aim that it could be built by a home-builder in a single-car garage) and the stress calculations were carried out by Bill Whitney. Two Falcons have been constructed to date, the first by Bill Knight (shown in the photo). Information on the Falcon was previously available at the Australian Ultralight Aviation website. It appears this website is no longer active. I have presented plans in two different sizes. One plan spans 22" (559mm) and has 129 square inches of wing area. Suitable for rubber or KP-01 power. The plan prints on 6 pages. The other is for a Peanut Scale (13" span) model. A model built from this plan has been successfully flown by Jiro Sugimoto. Details of Jiro's model can be found at the Small Flying Arts webzine. The Amsco monoplane is a rare Australian light plane developed by Percival "Perc" Pratt in Geelong in the 1930s. The plans are drawn for a 330mm (13") span Peanut scale model for rubber power. The plan prints out on 2 sheets of A4 paper. I've flown my own model built from this plan. The M1C was designed by Bristol Aircraft in the UK as a WWI fighter, and two were imported to Australia by Harry Butler. One was modified for racing by Horrie Miller, with a Gypsy inline engine, and a slimmer fuselage. The plan is for a simplified model to the "neo Dime Scale" rules of the Flying Aces Club (FAC). Several models have been constructed from this plan, including Kevin Mooney's version, shown in the picture. As World War II loomed on the horizon, Australia needed a training aircraft to train the new generation of pilots who would soon be needed. So the Wackett was developed to meet this need. The two prototypes featured in-line Gypsy Major engines, but these turned out to be underpowered. But they still make a good subject for free flight scale model. The plans are drawn for a 406mm (16") span "Pseudo Dime Scale" model of the Wackett prototype for rubber power. Plan prints on 2 pages. The solution to the under-powered state of the CA-2 prototypes was to install a more powerful Gypsy 6 engine, but the supply of these engines from England was in doubt. So the Warner Scarab radial engine was finally selected as the powerplant. In this new form, the Wackett met the requirements of the RAAF trainer specification, and 200 Wacketts were constructed and saw service with the RAAF and the Dutch East Indies Air Force (now Indonesia). The plans are drawn for a 406mm (16") span "Pseudo Dime Scale" model of the Wackett for rubber power. The plan prints on 2 pages. The CA-15 was a prototype fighter developed in the closing stages of WWII. It represented the peak in piston-powered fighter performance. I've presented plans at two different sizes (see at right), showing all formers, ribs and other templates. The Ceres was developed by CAC in the 1950's as an agricultural aircraft for top-dressing and spraying. It was a new design, but utilised some components from surplus Wirraway trainers. It was larger and heavier than the Wirraway, but its improved aerodynamics resulted in much better handling. The pilot was seated in a raised cockpit (higher and further aft than the location of the rear seat of the Wirraway) for an improved view. The landing gear was fixed. Large slotted flaps were fitted as were fixed leading edge slats on the outboard wing panels. The plans are drawn for a 610mm (24") span scale model of the Ceres for rubber power (prints out on 6 sheets of paper). 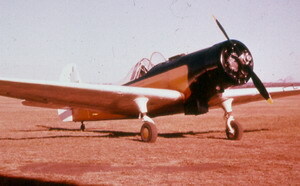 The Winjeel was developed in the late 40s and early 50s as an ab-initio trainer to replace the Tiger Moth in RAAF service. It continued in service into the 1980's as a forward air control aircraft. The plans are drawn for a 660mm (26") span scale model of the Winjeel for rubber power or a geared KP-01 electric. Wing area is 97 sq ins. The plan prints out on 9 sheets of A4 or Letter paper. The model shown at left was built by Sidney Elliott from these plans. After venturing to England and working with Avro, John Duigan returned to Australia and built a second tractor biplane in his backyard in suburban Melbourne in 1913. Here's the plan for a 635mm (25") span free flight model of Duigan's 1913 biplane powered by a KP-01 geared electric motor. The Nomad is a twin engined STOL utility aircraft developed in Australia in the 1970's. This plan is for a 710mm (28") span rubber powered model of the Nomad N22. The plan prints out on 10 pages, showing all formers, ribs and other templates. The Lightwing is an ultralight designed and manufactured in Australia to meet ANO 95.2. I first saw the Lightwing at the SAAA Mangalore airshow in 1986. Its simple lines and large wing make it an ideal scale model subject. This plan is available in 2 sizes: 20" span for a KP-00 or 30" span for a KP-01. Australia has always been one of the world's largest agricultural producers, and this has fueled the demand for agricultural aircraft. 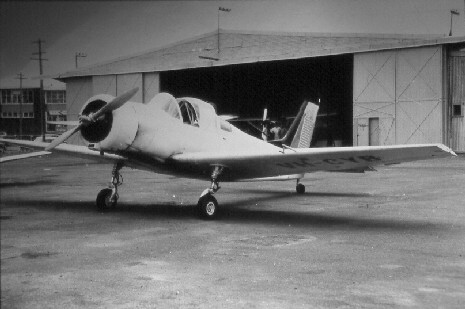 The KS.1 was a post WWII conversion of the Wackett trainer for top-dressing and spraying - by replacing the front cockpit with a hopper. The plan is for a ½" scale (1:24) rubber powered model of 470mm (18.5") span. Following on from the KS.1 and KS.2, the KS.3 was the first production version of Kingsford Smith Aviation's Cropmaster. The KS.3 featured the pilot in the original front seat position of the Wackett, and the rear seat was replaced with the hopper. The plan is for a Walnut Scale rubber powered model of 457mm (18") span. The SC1 was a prototype for a 4-place trainer or tourer. It first flew in 1962, but never went into production due to competition from imported trainer aircraft. The sole prototype is now being restored at the Museum of Army Aviation in Oakey, Queensland (on loan from the Australian National Aviation Museum at Moorabbin airport in Melbourne). This plan is for a 520mm (20.5") span rubber powered model. The plan prints out on several pages. It includes templates for "do it yourself" printwood. Developed from the Wackett trainer, the Cropmaster was a purpose-designed crop duster. This plan is based on the first production YA-1 aircraft, featuring the original wooden Wackett-style empennage. This plan is for a 610mm (24") span rubber powered model. The plan prints out on 6 pages. All rib and former templates are shown. In order to test a new all-metal empennage for the Cropmaster, Yeoman Aviation modified a single Wackett airframe (VH-AIV) with the new tail unit and canopy design. The Cropmaster went through several developments during its service life, the final version featuring an all-metal wing and all-metal empennage. This plan is for a 610mm (24") span rubber powered model of the final version. The plan prints out on 6 pages. All rib and former templates are shown. In 1911, John Duigan went to England and ordered a plane from Avro to his own specifications. The result was the Avro-Duigan. Avro subsequently developed this aeroplane into the Avro 500 which was the immediate predecessor of the famous Avro 504. The plan presented here is for a 635mm (25") span free flight model powered by a KP-01 electric motor. The Auster Mk III was developed by Taylorcraft Aeroplanes (England) during the Second World War as an observation platform for artillery spotting. It was also adopted for communications roles. Many Mk III aircraft made their way to Australia, and the Mk III was also assembled Down Under. The plans presented are for a 610mm (24") span rubber powered model, with scale framework layout (the balsa parts match up with the steel tube framework of the full size aircraft).